My phone’s too slow! I guess its time for a new one. That’s what some might say, but with the right tools you may not need to upgrade just yet, saving you the money and the time required to get a new phone. 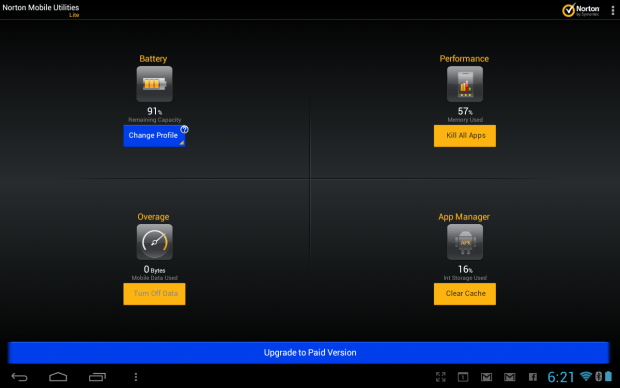 Norton has come out with many different utilities for Android, such as an anti-virus app and various other programs. Now they’ve come out with Norton Utilities & Task Killer. Norton Utilities & Task Killer is designed to do quite a few things, such as speeding up your device, killing apps that use a lot of memory, and even track voice, data, and text usage. There are two versions of this app — free and paid. The free version is “featured limited” while the paid version costs $9.99, which is quite a hefty price tag in my opinion. Looking at Norton’s description, it looks like the only major features not available in the free version are a battery booster, ability to automatically kills apps, and the ability to track data, text, and voice while roaming — everything else, such as managing apps, tracking device performance, and monitoring data, voice, and text while not roaming, is available in the free version. For the purposes of this review, dotTech tested the free version. I can see this tracking feature in Norton Utilities & Task Killer to be quite useful, since none of us want to end up paying extra at the end of the month. Now, I’m sure someone is probably thinking, “Well, Cole, there are many data usage tracking apps  that can already track this type of thing, why should I download this one?” Well, sure, there may be other apps out there that can already do this, but this app can also do a lot more than just tracking your device’s usage — which makes it a useful utility as opposed to a app that only does one thing. Norton Utilities & Task Killer features a clean and simple interface, which seems to be quickly becoming the standard among most apps these days. When you launch the app, you are greeted with a main page that links to the different parts of the app, which is organized quite well. From what I could see, you don’t have to be a rocket scientist to understand how this app works, which is a very good thing. The next feature I’d like to point out is the ability to backup apps over to your SD card. What I mean by this, is you can copy the app’s file over to the SD card. This could be useful if you want to make a quick backup. If you are looking for more move to SD card capability (i.e. app2sd), then this app can do that, too. Norton Utilities & Task Killer also features an uninstaller, which is a nice feature to see and is very fitting with the rest of the app. The only problem is, it is actually more complicated to use this uninstaller than it would be to just go about the uninstall normally with Android’s built-in uninstaller. Google has made it much easier to uninstall an app in Jelly Bean; now all you have to do is open the app drawer, press and hold on an app, and then drag it over to the uninstall button. The uninstalling capabilities of Norton Utilities & Task Killer are about on-par with what people who are still on older versions of Android experience. Overall, this is a nice feature, but isn’t a make or break feature either. As I mentioned earlier, you can improve the performance of your device by killing apps that are memory and CPU hogs (aka this app includes a task killer , which, when used wisely, can help you better manage your device). Aside from that, Norton Utilities & Task Killer also gives you a simple breakdown on the performance of your device (e.g. CPU and RAM usage), which is a very useful tool out there for those geeks that want to take a look at that information. The only question is — is it detailed enough for geeks? Maybe. However, for us non-geeks, the simple performance breakdown is good enough. It will show you how much memory is being used in real-time, and then give a breakdown on which apps are using that memory on your device. Norton Utilities & Task Killer also gives you a simple breakdown of the CPU performance on your device and gives you a breakdown of the amount of data each app has used, which can be very useful to people who are trying to minimize their data usage. In the end, Norton Utilities & Task Killer is a pretty good app in my opinion. And though it does have it’s flaws, they really don’t take away from the app much. I think that Norton has done a good job here, and I really hope to see future updates to this app that add even more functionality to it. It’s wide variety of features make it useful to a wide variety of people and it does a good job of putting a bunch of different functions together in one app.